Everythings going digital these days, comics and illustration included. While being the old codger that I am at thirty something, I stay behind the curve with my pen, paper and newsstand copies, doesn't mean I can't appreciate all the new mediums can offer. 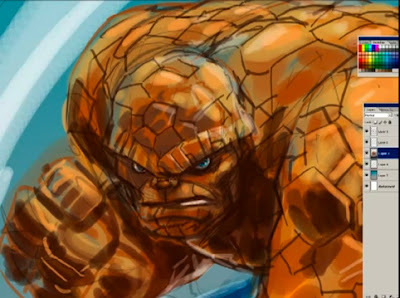 Especially when said new medium is used by the blazing hot Yildiray Cinar to show how he draws my favourite Marvelitte - The Thing. Watch talent at work folks, just click the p-l-a-y. How awesome was that? If only more Pro's did this kind of stuff. It gives you a real eye-opener into how they lay their work down. Of course, to see more of how Yildiray lays his work down, you can also take this conveniently placed digital jump. I know Random, it's pretty sweet seeing stop motion bring his art to life huh? Yildiray has also done Geo Force in this style., so be sure to jump over and check it out.